EMT stands for Emergency Medical Technician and these brave and fearless men and women don’t know what a 9 – 5 job feels like, since their job can allow them to be called out any time of the day or night. They live with the sense of having only a limited time to get to the place of action, and many times they are the first on the scene to render medical aid and evacuation of the patient to the nearest medical center. The EMT scope of practice entails being available, constantly, to others in need. The First Responder, in their scope of practice, will arrive at the scene of trauma, assess the patient and be allowed to perform Basic Life Support treatment which includes things like cardiac defibrillization, CPR, hemorrhage control and administration of oxygen. Sometimes they may administer epinephrine, depending on which state they are performing duties in. The First Responder for instance has basic skills to assess a patient and to also stabilize them for transport. The scope of practice can be defined as those emergency activities and treatments that EMTs can or cannot do as defined by law. The purpose of legalized scopes of practice is to ensure that all those people involved in patient care have the required education, training, and certification to perform certain duties. There will be cases where people may be willing to do things that lie outside their scope of practice in order to attempt to save someone’s life. Unfortunately, many times in such scenarios, the medication or treatment is applied inappropriately and the patient goes into cardiac arrest or passes away. Things outside the scope of practice are more likely than not something for which the emergency medical technician has not been trained. The EMT follows medical direction at all times as communicated by a doctor, but when the scope of practice is deviated from the patients’ health and well-being is affected, and not only does the EMT come into disrepute, but the entire profession can be blemished because it did not adhere to high standards. In medical practice one can’t go ahead and make your own decisions because patients entrust emergency medical technicians with solid decisions that come from experience and not just something they have thought up themselves. Ideally, emergency medical technicians as well as other health providers work collaboratively to provide quality patient care. Sometimes a mentally competent adult may refuse emergency medical care and the EMT scope of practice includes making sure that the patient consents before beginning emergency care. When treating a minor, an EMT must obtain the consent of the parent or guardian. It is within the EMT’s scope of practice to get the patient to fill out a refusal form, after they have tried to persuade the patient to receive care and medication. When an EMT is on duty they are required by law to care for a patient who requires it. On the other hand, it is not required of an EMT to help a patient when they are off duty. If the EMT stops to help a patient, they are required by law to help the patient right up to the point when the patient is transferred to a medical facility. All of us can remember occasions when we have seen EMTs at work among the sick, injured and traumatized, quietly getting the job done. 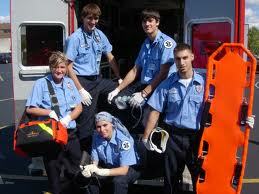 The requirements of an EMT job are demanding, physically and emotionally. They have to be physically strong and in shape to pick heavy bodies up and run with them to safety. They also have to be emotionally stable to handle people and animals who are mangled, suffering and beside themselves with grief. People cannot be blamed for getting a bit confused about EMT’s and their scope of practice because first of all they are called different things in different states, and their duties differ from state to state. The most common certification in emergency medical services is the EMT with different levels of certification common to most states. Although EMT-Basic, EMT Interediate and EMT-Paramedic are known in some states, they are called other things elsewhere and EMT-Intermediate is even falling away in some areas. In the industry EMT-Paramedics are referred to as plain paramedics, and where a paramedic may be trained to suture in one state, in another state that would not be in their scope of practice. Both basic EMTs and paramedics respond to emergencies, but where basic level training provides elements of emergency medical training, the more advanced EMT paramedic addresses the care of patients after initial resuscitation. Emergency medical service is certainly a complicated industry. It is quite complex to pin point the way things should be done simply because there are different rules in each state. If you are really in doubt and want answers, you can contact your state’s EMS office for information and advice. EMT scope of practice defines permissible activities for emergency medical technicians. Their scope of practice is determined by laws within a particular state. Any health care workers who violate these laws can jeopardize their chances of practicing as an EMT, they could lose their professional license and could also face civil lawsuits. The appropriate scope of practice for EMT’s is to ensure that the public is always at the receiving end of medical help from those who are actually sufficiently trained and qualified to offer them. It happens quite often in a health care scope of practice that the question comes up about whether a licensed medical professional may prescribe medicine. Sometimes there are restrictions on what type of drugs may be prescribed. In the United States, not every health care professional is allowed to prescribe certain drugs . An EMT may be able to dispense medication to a patient under a physicians orders, but without the proper licensing, they would not be allowed to. In some areas of the United States for instance, a licensed EMT may not be able to start IVs, while somewhere else they may be allowed to. The scope of practice as permitted by law may be even more limited in certain health care institutions. A hospital may have a policy of restricting the activities of anyone who isn’t a physician as a cautionary measure, even though the law in that jurisdiction permits other licensed health care workers to perform the procedure or activity. EMTs and other medical staff need to understand institutional policy so that they do not take part in practices that are assumed to be within the scope of their tasks. There are four levels of EMT and each level will have its own minimum skills and knowledge base. A level 1 EMT or First Responder is the most basic EMT and cannot administer any oxygen or medications. They are able to control hemorrhaging. Their certification lasts for four years. EMT Basic – depending on where they practice, EMT-B’s are trained in CPR as well as automatic external defibrillators. EMT Intermediate – has far more training and experience. The EMT-I/99 level is the closest level of certification to Paramedic, and these EMT’s may perform many techniques that the EMT-Basic may not – what they are permitted by law to do varies significantly from state to state. The thing to remember is that each state needs to review the National Scope of Practice Mode in light of their own laws and regulations, and new laws will need to be implemented and training programs updated. While EMTs work primarily out of their ambulances, there is an increasing number functioning in health care settings like physician’s rooms, hospitals, sport departments and clinics for instance, and the EMT scope of practice in these fields mean the maximum level of care that the EMT or First Responder may provide. Their scope of practice basically includes, but is not limited to, things like patient transfers to different medical centers, vitals, medical and trauma assessments, the administration of different types of drugs, basic life support as well as other things. Certain treatments will only be allowed to be performed if the First Responder and the EMT have received training approved by the EMS Board. Every community may tailor the protocol to their particular region, but must ensure that they remain within the approved scope of practice. Scope of practice statements provide guidelines to EMT’s who face situations outside of their normal scope of practice. EMT scope of practice is made harder by the fact that each individual state has their own scope of practice. It is true that when it comes to non-invasive patient assessments, nobody is particularly going to worry about who is doing what, but when it comes to something for more invasive like cervical dilation then its going to be important to know who has the training to do what. Some procedures must be authorized by the right medical authorities and must be performed according to written and published protocols. Some procedures may even require direct verbal orders from medical command physicians. EMT’s may disobey the instructions of a physician whenever the instructions are obviously wrong and are going to result in harm to the patient. Sometimes an EMT will question a physician’s orders particularly if the EMT sees that the orders actually contravene established best practices and are about to jeopardize the safety of the patient. Many times also, due to the unavailability of physicians, emergency medical technicians may sometimes find themselves having to make quick decisions that under regular circumstances would be made by physicians. Many people think that an EMT and a paramedic are one and the same thing but certainly not. An EMT gets about 150 hours of basic training while a paramedic around 1800 hours for a trainee paramedic and where an EMT with their scope of training may not be allowed to give intravenous injections for instance, paramedics are allowed to give shots plus other more advanced treatments. EMT Basics may also perform any procedure or administer any drug contained in certain protocols. They work in conjunction with other medical providers and when operating in the pre-hospital environment, their actions are governed by protocols set by higher medical authorities. The EMT-B is the lowest level of EMT certification and their scope of practice allows them to perform the most basic procedures while out in the field. They are allowed to administer oxygen and glucose. Some states allow an EMT-B to perform some duties alone, depending on the health department regulations. EMT-Basics are trained with the necessary skills to assess a patient’s condition. The training and scope of practice will allow them to provide care for cardio, respiratory and trauma emergencies; all the time being overseen by a physician. It is most important that EMTs who offer professional medical services, maintain adequate knowledge of all their training in order to give a professional and efficient level of service. Patients expect that EMTs have undergone rigorous training in order to attend to them in their need with adequate knowledge and skills. The medical profession is huge with a vast number of professionals all possessing different skills and levels of expertise. Each fraternity has their own code of practice to ensure that everything is done correctly, and that the lives of patients are not put in the hands of people not authorized to treat them.